January | 2011 | Ooh, my favorite! 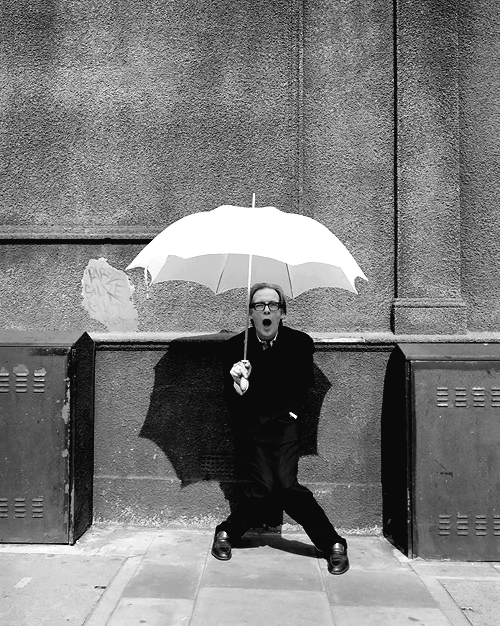 Thank god for Bill Nighy! 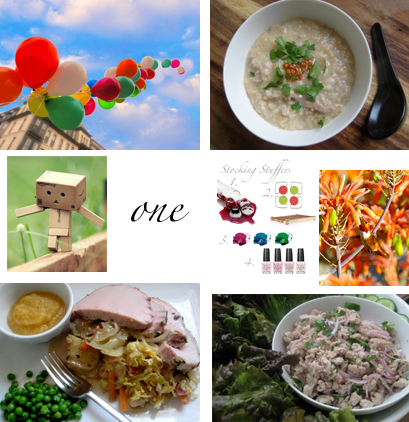 Aside from my bloggiversary yesterday I had a terrible, terrible day. The kind of day that literally has me in hiding; mulling over all the things, I realize now, I had been repressing. It’s one thing to have an ah-ha moment, but entirely another to have one in front of a room full of people. You’ve seen it all before (most likely in a terribly cheesy chick flick): Girl finds “perfect” scenario, Girl starts to see the cracks, Girl pretends everything is alright; and suddenly, at the worst possible moment, Girl goes down in blazing glory (usually in a room full of people). Really, it’s the kind of scene where you want to slap Girl, at least I did until I experienced this for myself…yesterday. Catch me at the right moment and I’ll laugh, but at the wrong one I’ll probably start bawling – the ugly kind, not the cute Girl movie kind. My head hurts. My stomach aches. But I’m happy today is Friday. One year ago I had just returned from Seattle with a cold and was dreading the thought of going back to a job I absolutely hated. I remember suddenly feeling overcome with the need to start a project, if only to avoid a Jerry McGuire moment in the office. I figured if I created a place where I could collect all of my favorites (with a few rants), it could only result in good things. So here I am, 250 posts and a year later in a whole new place. Long gone is the job from hell, and I’m left with only the best pieces of a year gone by; looking back through my archives, I am happy. I love sharing the fun and interesting content I find and the occasional recipe I attempt, but I often struggle with the best way to share my often intense thoughts on living a healthy life while being mindful of our impacts on things big and small. I know that sometimes it’s not the most entertaining or easy thing to read, but I hope you’ll continue to visit me not just for the fun and carefree, but for the anti-cancer and sustainable. Last I heard there were around 144 million blogs in existence. That’s more than a lot of competition, so the thought of you here visiting means the world to me; and really, I don’t know how to express how truly humbled and thankful I am. If only you knew how my heart raced with each new view or thoughtful message. I love my little corner of the world here and I am so excited to share with you another year of favorites! In case you were curious, here are your favorite posts from the past year! 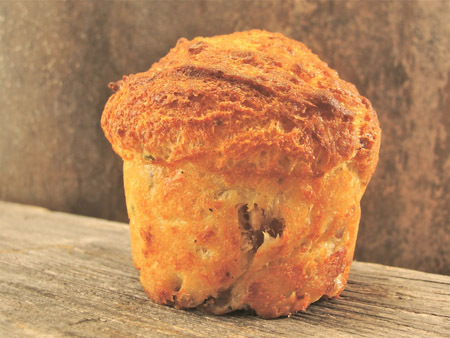 Dreaming of this sinful delight from the Tell Tale Preserve Company here in SF. 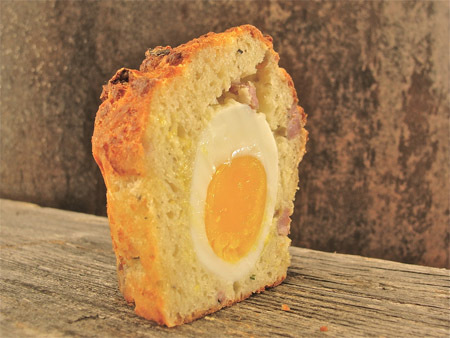 Are you ready for this: Easton’s breakfast sausage and a soft cooked egg hidden inside this savory cake. Guess it’s back to the Ferry Building on Saturday. Dangerous! I get a lot of questions about natural alternatives for skincare, and while I’m not a product junkie I have spent a lot of time researching natural remedies (with a lot of help from mom, too). It doesn’t come in fancy packaging (although I do wish it was glass), and it doesn’t have a pretty French-sounding name, but Witch Hazel is one of my favorite products! It’s a cheap and easy way to add a natural alternative in place of conventional astringents and toners. After cleansing, the purpose of a toner is to remove excess oil and dirt, but also to close the pores and restore pH balance. Witch Hazel is a natural antiseptic, so if you make sure the product you’re getting is alcohol free, it can perform all the functions of a conventional toner, but without the added preservatives and chemicals. To apply it I don’t even use a cotton ball (it’s just one other organic item to add to the list, and really it’s just not worth it), so I just pour a tiny bit into my cupped palm and splash it on my face. After that you’re free and clear to lotion it up. Bottom line: it’s natural, it works, it’s cheap, and it will last you quite a long time. Many different varieties here for about $6. I had a wonderfully productive weekend at home, just like I said I would! I got into the zone late Friday night and ended up rearranging the bookshelf and our bedroom. Our space is really small so there aren’t many ways to switch things up but I did manage to find a new home for a few things. I think that much of my desire to do a bit of mid-winter organizing was because of the beautiful picture above. 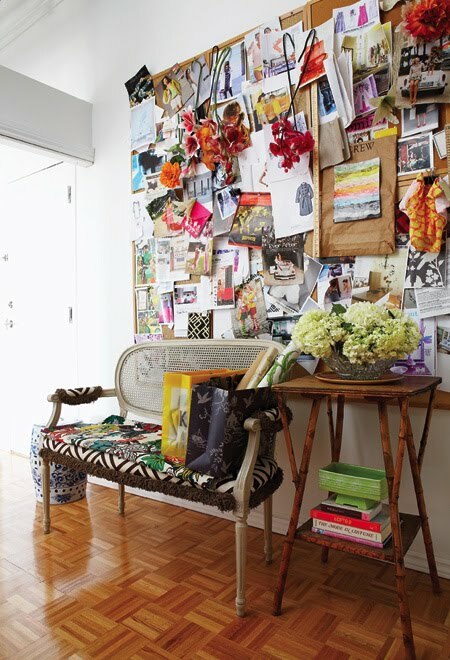 The inspiration board belongs to interior designer Sabrina Linn (which I found by way of the wonderful Black Eiffel) and I haven’t been able to get it out of my head since. 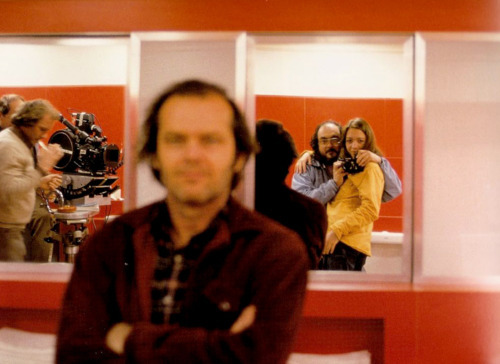 Truly, I think I have visited this picture about 27 times in the last 10 days – it’s haunting me in the most fabulous way. Really, the entire composition is gorgeous, but the idea of proudly displaying a collection of inspirations for all to see is just…well, brilliant! Granted, it would take discipline to keep it presentable, but I am truly enamoured with this idea. With our tall ceilings we have a huge blank wall that’s been bare for the past year. Until I can afford to invest in an original Rex Ray that I so covet, I think this would be the perfect place for a thoughtful, well-composed, his & hers inspiration board. New project: identified! My favorite aisle in the grocery store is the gourmet condiments section, the one with artisan pickles, mustards, and spreads. I don’t think I’ve really detailed my affinity for composing the ultimate snack board, but I take pride in selecting the perfect ingredients, especially a selection of pickled items. 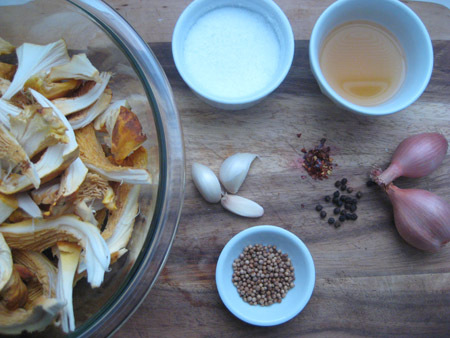 If you’ve ever ventured down my favorite aisle you probably noticed how pricey some of these items can be; and to be completely honest, it’s easy to select something really isn’t worth the price, which is why I flipped when I came across this pickled chanterelle recipe over at Chez Pim. Perfect for a fun weekend project, perfect for a snack board. I’ve been positively green with envy as I follow Pim’s tweets on her mushroom foraging excursions, and while I wasn’t able to find these little treasures on my own, I did find a nice selection at the Ferry Building market last weekend. 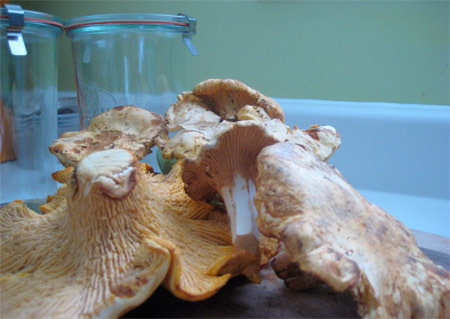 I hope to do a few more batches before the chanterelle season is over, but the good news is that this recipe would work on any variety of mushroom. Here’s my take on the recipe via Pim, who believes this may have come from Jean-Georges. As always I added a dash of red pepper flakes and a touch of agave. 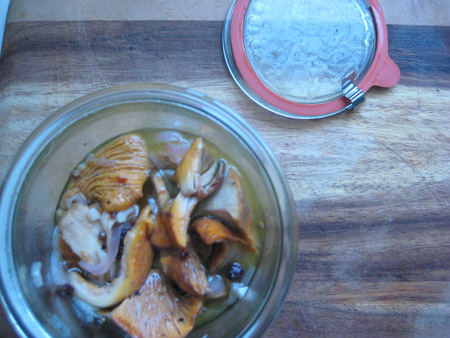 Bring a pot of water to a boil and add the mushrooms for 1 minute. Remove with a slotted spoon and rinse until you are able to handle them. Squeeze out the excess water and set aside. Tip: Do not pour into a colander as some dirt will collect at the bottom of the pot. In a separate pot add a tablespoon of olive oil and bring to temperature. Add the shallots and garlic and sautee until translucent, careful not to brown them; adjust the heat down if necessary. Add the remaining ingredients and simmer. Add the blanched mushrooms, stir to incorporate and remove from heat. Set aside to cool slightly. Pour into an airtight glass container and refrigerate for 24 hours before using. I cheated and had some after only a few hours and they were wonderful! They’ll keep in the fridge for a few weeks (just in case you’re trying to ration them).